This item has been manufacturer refurbished to like brand new condition. A 90 day warranty is provided with this item and all the original accessories that would come with a brand new unit are included. The 25 LTD Classic is back by popular demand with improvements. Perhaps the best of these improvements is the front panel microphone connector which makes in dash installation a cinch. Cobra has also provided a nine foot microphone cord so that you keep in touch about anywhere in the cab. Not only that, but the tactile controls provide safer, and more accurate, functionality. 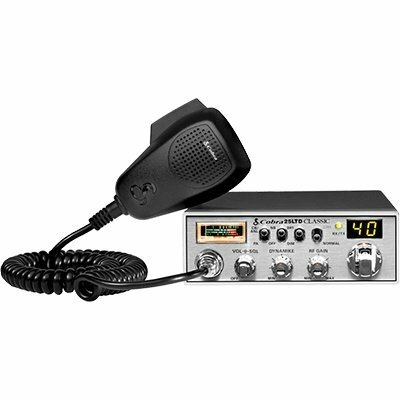 The 25 LTD Classic is rugged professional full featured CB radio with professional driver requested improvements. Other features of the Cobra 25 LTD Classic include: instant Channel 9, PA capability, dimmer control, switchable noise blanker and RF gain.